This is G o o g l e's cache of http://forum.bustalk.net/index.php/topic,1019.0.html as retrieved on Feb 15, 2007 20:55:09 GMT. Just saw it on Channel 7. At least one bus that survived the takeover is toast. Just saw that myself, and it seems that the CNG filling station was affected... probably from the construction that they were doing right outside the depot. Probably some construction worker accidentally struck the line or something of the sort and BOOM! On another note, also saw the charred bus-- ow! No juice for the CNGs will be a major problem. Is the diesel fueling area in the same place? In the first pic, the building that exploded and was burning is to the left in that pic. In this pic, an MCI Cruiser was parked *right* next to it. On the news coverage, an RTS was parked right next to it, fortunately or unfortunately, rather than an MCI. You can also notice the sign warning of the emergency CNG shutoff valve. In the second pic, you can see the same pic right behind the MCI's, the reddish one, that's the one that was burning furiously on the news and the one I presumed housed the CNG refuel pumps. And in this last pic, these white storage tanks are loacted just a little behind the building that was burning in the coverage. If these are actual storage tanks, I guess we're lucky they didn't blow also. More than likely, the MTA is going to instate new precautions now at other CNG facilities due to this accident. Also, I would ASSume that all of LGA's Orion V CNG's will be sent off to CPD and Spring Creek now since they're refueling pumps or offline indefintely with no way to refuel them for the near future. And those respective depot's diesel RTS's will be sent to LGA in exchange. An apparent gas main explosion in the East Elmhurst section of Queens sent up a large plume of black smoke that could be seen for miles. The explosion was underneath the intersection of 23rd Avenue and 86th Street, near the Triboro Coach Corporation bus garage, just before 11:00 a.m., officials said. A compressed natural gas line suddenly exploded, setting one bus on fire. Firefighters battled the flames for 30 minutes until Keyspan shut off the gas. Firefighters transmitted a second alarm on arrival for the explosion. No injuries were immediately reported. 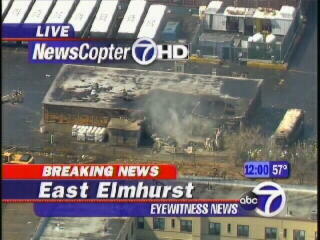 The explosion was located on a depot owned by the Triboro Coach Corporation. I really hope everyone is okay and there were no injuries or worse. Hopefully, we'll hear from TCC Senior Man and the rest of our friends and co-workers at LaGuardia. What more can I say but unbelievable. The pictures are incredible. Thanks BK for posting them. How has service on LaGuardia depot routes been affected? A two-alarm fire that sent flames shooting from a Queens bus depot a few miles from LaGuardia Airport on Monday started while workers were attending to a natural gas line, officials said. The cause of the fire, reported at 10:43 a.m. at the Triboro Coach Corp. depot, wasn't immediately known, Fire Department spokesman Seth Andrews said. No injuries were reported. The fire destroyed one bus and damaged 12 others, said Tim O'Brien, spokesman for the Metropolitan Transportation Authority. Triboro Coach operates more than 250 buses in Queens, and was taken over by the MTA earlier this year. Two workers from KeySpan Corp., which provides natural gas to some of the buses on the site, were removing gas from some of the storage tanks and reintroducing it into the system just before the fire, Keyspan spokesman Jody Fisher said. "There had to be some sort of spark" to start the fire," Fisher said. "We haven't determined what it was." The gas was turned off shortly after 11:30 a.m. Operations at the airport were not affected, said Port Authority of New York and New Jersey spokesman Pasquale DiFulco. I assume we will know more when we receive word from the media that the MTA has made a determination and prepared associated statements. Most probably by our 5-o'clock news, so stay tuned. Meanwhile, most of our participants from LGA are most likely still at work, so we'll await their report and observations when they find the time to inform and update us first hand. I just happen to be out on a rare sick day(bronchitis), but was astonished to hear and see what happened!!! I overheard a few weeks ago one of the Keyspan techs taking about what was being reported in the news today that the CNG that was stored in the tanks was going to be reintroduced into the keyspan system. He said that the amount of gas there would heat a home for about three years. It's under 3,000+ psi. This section is where the gas enters from the street and is not the CNG pumps. Also the diesel buses are fueled in the front of the building on 85th street, and should not have been affected, with the exception of the loss of the parking spaces. I know that there was a tremendous amount of construction going on on 87th street, and right there where the fire was, but I don't know if that sparked it. The building that is affected, houses the Tire shop, CNG A/C shop and the non revenue vehicle shop. What looks to be the most affected portion is a storage room for records and such. The white "egg crate" looking stack to the left of the fire was pallets of brand new rims. After watching the coverage on all channels, FOX had a somewhat close up of the charred remains of the RTS-04 and it was/is an ex-Jamaica RTS-04. WABC said that some firefigther officials are saying that construction may have caused the explosion, while FOX said that the construction going on outside of the depot was to dig up old CNG tanks buried underground near the depot. Forgot to say one more thing (and I can't modify last post, too), but I guess more than the average amount of buses will be parked outside on the streets of the depot seeing that the charred RTS-04 is still sitting in the depot and the slots are still open. In the pics that Driver posted, LGA had alot of its buses out on Astoria Blvd. parked (figuring that fire engines were parked in operation on 23rd Ave.), I wonder if that'll be same tonight. Guess the MTA has to hire a few more security guards to watch the buses, unless the NYPD post someone at the accident site just in case. Service is running normal except some bus route near LGA depot, minor delay with police/fire activites. The only routes affected are the Q33, Q48 and the M60. All of which run along 23rd Ave (which has emergency vehicles parked along it). Good thing the MTA already transferred most of the CNG Orions out of LGA. Otherwise, this could have been MUCH worse. Hope you're feeling better! You picked a great day to pull sick! Have you heard from your co-workers about the issue? Any further details on the status of the employees and equipment? Wow, thankfully nobody was seriously injured as that was just a nasty fire and the damage to the GM RTS is unbelievable. I passed by earlier and the bus is a absolute skeleton to put it bluntly, also the equipment was moved around as a precaution, including a clip that I saw on NY1 this morning that showed two Orions being moved away from the powerful blaze. Also, there was a significant number of MTA Bus personnel along with the Fire Department examining the evidence and the works. The building also had some damage to the point where it could see demolition in the future. At about 11:00 a.m. today, one of our starters made a general announcement to all Q-33's to avoid 23rd Ave entirely and to use Astoria Blvd. both to and from LaGuardia Airport. About 5 minutes later he came back on to announce that all buses that were returning to the garage to to layover on Astoria Blvd. and that they were not to return to the garage. Sirens could be heard in the background but we still did not know at this time what was occurring at the depot. Several minutes later, maybe 15 or 20 minutes, Road Operations began to announce that there was an Emergency at the Garage and that the LaGuardia Depot was closed to all incoming buses. It was later that Road Ops made an announcement that all buses that had been scheduled to return to LaGuardia Depot were to proceed to College Point and await additional instructions. Road Ops kept repeating this message approximately every 15 minutes or so. In addition, Road Ops attempted to answer any questions that Bus Operators had in response to this emergency. Biggest concern was how were they going to get shuttled back to LaGuardia Depot to get their cars. At some point during the fire, Road Ops made the announcement that a"State of Emergency" had been declared at LaGuardia Depot. It turned out that ALL Employees from LaGuardia Depot as well as businesses in the surrounding area were evacuated. This included Standard Folding Cartons, the Kings Inn (motel next to LaGuardia Depot) and a Children's Day Care on 23rd Ave. This evacuation lasted well over 2 hours. I finished my run and headed to the Depot around 2:00 P.M. and it was around this time that employees from LaGuardia Depot were allowed back into the property and buses were permitted to return to this location. Jeff is right about the building affected by the fire. It was the tire shop & A/C shop that were engulfed. These areas are destroyed and apparently will have to be razed. The roof of the A/C shop has partially collapsed. I was unable to get close enough to see the extent of the damage of the interior of the tire shop but it is extensive. A former Jamaica Bus was the only bus that was completely destroyed in the inferno that took place. Someone told me that 2 other buses (unknown which ones) sustained water damage. FDNY sprayed all surrounding buses with water in an attempt to prevent any possible fuel tank explosions from those buses that could not be moved in the seconds after the fire initially started. I was told that several cruisers were moved out of the property at the onset of the fire. I did a tripper this afternoon and when I returned around 7 PM, FDNY was again throwing water into the affected building. My guess is that apparently the fire may have flared up a bit. Yellow Caution tape extended all around the affected building and MTA Personnel were assessing the damage. Other workers were removing what could be salvaged. Word at the Depot is that construction workers working on 87th Street may have been responsible for this fire. Someone said that a backhoe being used may have struck a gas line causing this near catastrophe. As far as I know, nobody was injured and we have to be thankful for that. Also, from what I could see, operations out of LaGuardia Depot were minimally affected. Some second halves left the Depot late because of some of buses that had been sent to College Point. Finally, this fire will not affect the CNG Operations at LaGuardia at all. I think that LaGuardia Depot was down to only 3 Orion CNG's. Remember that CNG's were going to be eliminated entirely at this location. That operation was nearly complete. This fire has probably put an end to CNG's Buses at LaGuardia as far as I'm concerned. Well, that's it for now. It's been a long day so I'm hitting the sack. I'll follow up with additional info tomorrow if possible. I'll believe it when I see it! Scary photos; I'm glad all of you are OK.
Methane truly is powerful stuff, even more so when highly compressed. Definitely agreed, thank god nobody was hurt, I guess this gives another reason for Laguardia and other depots to be careful. I guess the addition of standard folding carton would be nice right about now. Its amazing that no one got hurt, the gas co. employees must have been quick on their toes. Do garages usually have emergency information planned out in advance for situations like this? Thanks for the detailed report TCC Senior Man. As with everybody else, glad to hear no one was hurt. News reports said only one civilian was slightly injured due to the incident and they have been released from medical care. As for the bus charred, the only thing left untouched on it is its front right section of it, you can still see the "Silent Hill" ad on the side and the MTA Bus logo and number, along with some livery to boot. What I do find strange is that it took a little under half an hour for KeySpan to turn off the gas. Thanks BK! It is kind of ironic. Nothing more to add, TCC Senior Man has it covered. Although the construction guys had a barrel fire going on Friday!!! I'm happy to learn both you and TCC are well and were unharmed in the event. Thankfully, as has been reported, there were no injuries at all. Remarkable, indeed. Something like this could have been quite devistating. Imagine if something like this happened while buses were waiting on a fuel-line queue? Not good. Great report TCC Senior Man, thanks for explaining in such detail, I feel as if I were there with you! BTW I cannot take any credit for the pictures. They are all news media images from various area stations. Links provided or captioned as the file name. See WABC-TV and WNBC-TV for more and further images as they post them. LGA may need more replacement buses because MTA reported 12 buses are damaged and 1 destroyed (RTS-04 1141). A friend of mine was down the block at Planeview Park watching the planes land when the explosion occurred. You can read her eyewitness account here. TCC Senior Man. Thanks for the detailed report. Thank God that there was no injuries and no one was hurt. The Twelve buses that where damaged can be repaired or replaced looking at the pictures the MTA Bus is Lucky that only one bus was destroyed. "Pipe"
Colossal flames hurtled into the air over a Queens bus depot rocked by explosions yesterday as workers offloaded a storage tank of compressed natural gas, officials said. "We heard a boom, then we saw flames, and the earth shook," said bus driver Mark Lawrence, who was set to begin his route at the MTA depot in East Elmhurst but fled when he heard a blast at 10:43 a.m. followed by another. One person suffered minor injuries, and fire marshals were investigating the cause of the two-alarm blaze but believe "it does not appear to be construction-related, and it's not suspicious," said Fire Department spokesman Seth Andrews. Two KeySpan workers were at the former Triboro Coach site to "decommission" the facility - that is, empty the tanks, because the MTA will no longer use the facility to fuel its buses with compressed natural gas. "There had to be some kind of spark that created the ignition that lit the gas. We're trying to determine what that was," said KeySpan spokesman Jody Fisher. The blast destroyed a bus as well as damaging 12 other buses and a depot tire shop. "We thought it was a plane crash," said Joe Sciortino, a bus driver who heard the blast. MTA spokesman Tim O'Brien said, "We still have CNG buses in use, but as we buy new buses, we're moving toward hybrid electric." There was no doubt that the MTA was already moving towards hybrid buses as the fleet of the future but this accident could certainly move the MTA away from CNG for good once these current buses in service are retired. These are the last 3 photos that I took today. Great pics, the damage is really bad, but not as extensive as I had thought from the looks of it outside, but still bad nonetheless. I guess it was a good thing that the fire didn't spread nor grow as quickly due to it being fed by the gas line directly and not another source available yet (besides the files already burnt to a crisp quickly). Though, if it had moved over just 50ft to the other side of building, that smoke would've been a lot more black due to burning tires and then things would've gotten out of hand. As said, fortunate thing that it happened like this (unfortunate that it happened at all). Bring a lot of buses out of retirement. We would probably see classics in local service. TCC Senior Man. Great pictures of the fire. "Pipe"
what a sad sight I passed by there this afternoon wow. TCC senior man what kind of buses were damged? I the NY Post lists that 12 other buses were damged. Are extra buses on the way? Hold out their hand to Bloomburg and say we need more MONEY!!! Great photos, sad to see. Will the tire shop look exactly the same when it is rebuilt or will it look different? No idea TransitGuy but rest assured that the MTA most likely already has plans in the works for whatever they decide to do. Great photos Senior man. Lets be thankful that the fire was only contained to the charred bus, the smaller buildings and away from the soon to be closed CNG pumps along with the main depot. A city bus and a garage at the former Triboro Coach Corp. bus depot were incinerated Monday after a ruptured natural gas main sparked a fire that sent a fireball into the air over East Elmhurst. Bystanders said they heard two explosions at about 10:40 a.m. and then watched as a fireball shot high into the air. They said the heat from the blaze could be felt a block away. Triboro Coach is now operated by the MTA. According to reports, a private contractor hired by the MTAwas digging a hole along 87th Street and 23rd Avenue when the gas main ruptured and the blaze ignited. MTAworkers moved buses powered by natural gas away from the blaze to keep them from igniting as well. The Vaughn College of Aeronautics, a day care center and a homeless shelter close by LaGuardia airport were evacuated. One MTA worker sustained burns to his hands but, according to reports, refused treatment at the scene. I was under the ASSumption that the rest of LGA's Orion V CNG's (all four of them I believe it was) were sent to another depot with no more CNG that could be supplied to the depot now. But, I just saw #7220 running on the Q18 earlier tonight. So, is it that LGA will keep those four CNG's and refuel as much as possible to empty out the rest of the CNG storage tanks at the depot? I know TCC Senior Man said the CNG pumps were not damaged during the fire and are still operational. And with KeySpan unable to reintroduce the CNG stored on the depot back into the main system, I guess the MTA has to empty them out into the Orion V's till they're empty. If that's the case, then what we thought as how this accident might accelerate the closing of CNG operations at the depot, it might as well have delayed it more so now that the only way to rid of the CNG is via the Orions, a much slower process perhaps, compared to the reintroducing into the main system, possible faster.